Can Anyone Knock Off Black Panther? - sandwichjohnfilms Can Anyone Knock Off Black Panther? For the first time since Avatar in 2009, Black Panther has clung to the top of the Stateside box office for a fifth weekend, seeing off the likes of Tomb Raider. The superhero smash has made more than $27 million this weekend, according to studio estimates. And Marvel's latest success story has hit another milestone, becoming only the seventh film ever to gross more than $600 million at the domestic box office. With its overseas takings, the movie has now crossed more than $1.1 billion. Tomb Raider could only manage $23.5 million in treasure found from audiences, earning it a second place launch. Will it go on to spawn a franchise, as Warner Bros. might hope? That will have to wait for its full takings figures to come in. More successful (especially in terms of budget vs. return) was faith-based drama I Can Only Imagine, which started its chart run in third $17 million, off the back of a $7 million budget. Slipping a couple of places to fourth, A Wrinkle In Time picked up $16.5 million, while new romantic comedy Love, Simon did decent business in fifth, taking in $11.5 million. Game Night fell a place to sixth, making $5.5 million, while Peter Rabbit was down to seventh on $5.2 million. Horror sequel Strangers: Prey At Night dropped to eighth place with $4.8 million, just ahead of Red Sparrow at ninth and $4.4 million. Finally, at 10th, we find the new Death Wish reboot, which grabbed $3.3 million but still hasn't cracked $30 million in the States. 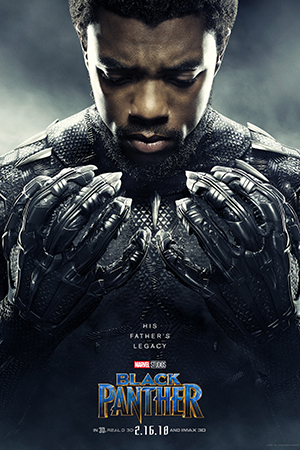 Keep up to date with all the latest movie news, click here to subscribe to Empire and have the latest issue delivered to your door every month.